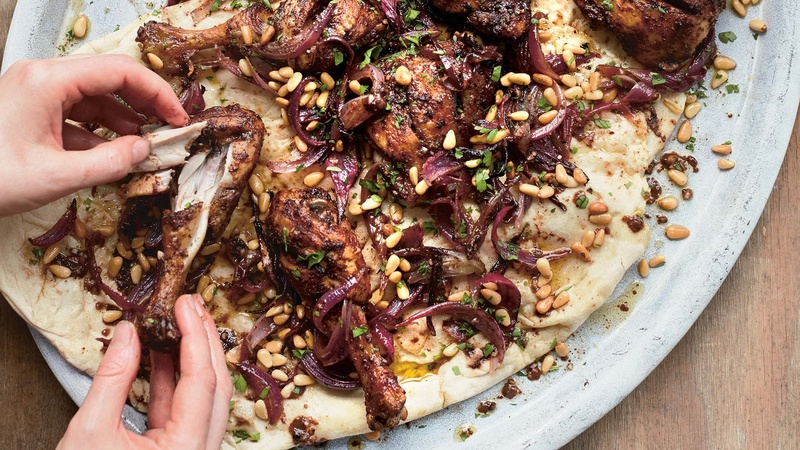 "Mussakhan is a classic Palestinian dish eaten in villages throughout the region," writes Yasmin Khan in her new cookbook Zaitoun, "Traditionally the meat is laid out on a giant piece of bread with the flavoursome roasting juices poured over it so that they seep into the dough. This platter is then placed on the table for everyone to pull off sections of bread and chicken: a wonderful sharing meal." Pour over the extra virgin olive oil, spices, lemon juice, garlic, 1½ tsp salt and ¼ tsp pepper and rub this into the meat. Add the red onions and toss everything together well. Cover and leave to marinate in the fridge for 1–3 hours. Fry the pine nuts in the light olive oil for a minute or so until they turn golden brown, then tip on to kitchen towels to drain. To serve, toast the naan or taboon bread and then place the chicken and red onion on top. Finish with a smattering of pine nuts, sumac and chopped parsley. Drizzle over any remaining roasting juices so they soak into the bread, then sprinkle over a little more extra virgin olive oil.